Students from Escuela La Flor de Bahia help their school earn its first Bandera Azul (Blue Flag). Students is grades two through six (2-6) worked with Geoporter and community volunteers weekly for seven weeks to work on its waste management initiative. 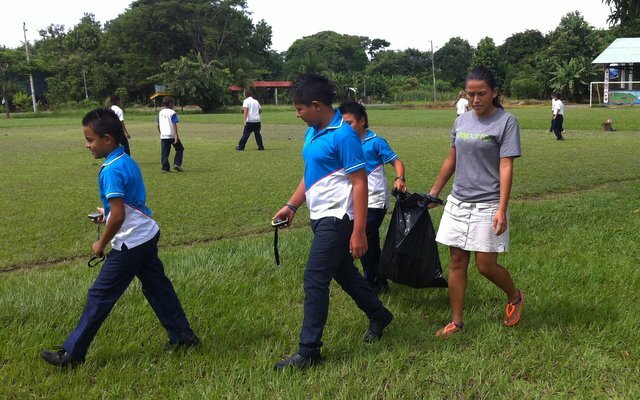 As such, students participated by mapping and collecting trash on school grounds, the adjoining soccer field, and street in front of their school. Quickly picking up on how to use GPS units, the students were off and running, collecting and recording the locations of where they picked up trash. They then downloaded their GPS points, creating their very own School Trash Map. The data the students collected was sent into the Bandera Azul program along with other school identified initiatives that include: water management, risk management, environmental education, status of health services, promoting clean spaces, developing an integrated waste management plan and energy. Before April of 2014, Escuela La Flor de Bahia will celebrate by raising its first blue flag on school grounds as part of the Bandera Azul program. This entry was posted in Basura, Escuela La Flor de Bahia, Featured, students and tagged Bandera Azul, basura, Escuela La Flor de Bahia by geoporter. Bookmark the permalink.